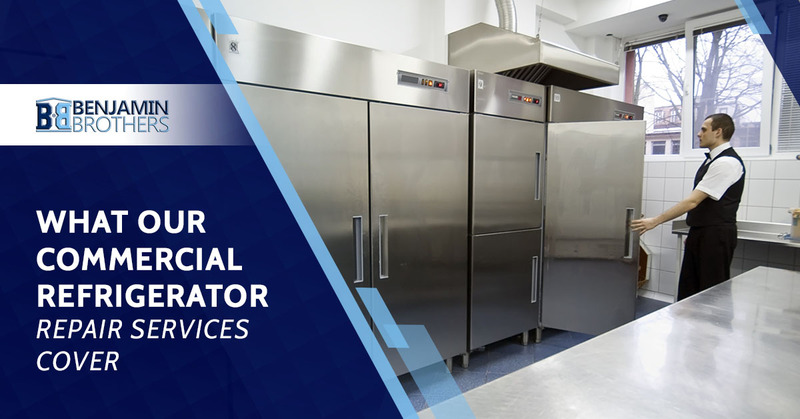 If you run a business which makes use of a commercial refrigeration device, it’s probably fairly essential to your services, which means it’s often a crisis when any of these devices fail. Although it is rare for this to happen, there’s always a chance, and you’ll want to act as quickly as you can if it does. That’s why you shouldn’t hesitate to call for emergency commercial refrigerator repair. This is especially true in Tampa, where we’re punished by a blazing sun year around. It won’t take long for heat to creep into your building, so if your refrigeration device suddenly goes belly up, you should call Benjamin Brothers immediately. However, refrigerators aren’t the only thing that is covered by our commercial refrigerator repair services. In fact, we can help repair a wide variety of devices. Keep reading to see if your cooling device would be covered by Benjamin Brothers in a time of emergency! While we could easily service a small, residential-grade refrigerator, walk-in coolers are on another level. Fortunately, you don’t have to worry. A walk-in cooler is essentially just a gigantic refrigerator, so the same concepts still apply. In fact, walk-in coolers are one of the most common subjects of commercial refrigeration repairs. This is due to the major problem that a broken walk-in cooler presents. Most restaurants are completely dependent on their coolers to store their ingredients, so if it suddenly fails, your restaurant’s entire livelihood is on the line. When food is left unrefrigerated, it doesn’t take long for it to go bad, or become ridden with bacteria. This is a risk that some homeowners are willing to take, but businesses simply can’t afford to. Not only are you setting yourself up for lawsuits, you’re also endangering every customer that walks through your doors. This is why we take commercial refrigeration repair seriously, and offer it 24-hours a day, seven days a week. A broken walk-in is a lose-lose situation for everyone, so it’s best to get it fixed ASAP. While it’s easy to assume that a broken ice machine would be little more than an inconvenience, there are actually many establishments that depend on ice for more reasons than simply putting it in their customers’ drinks. Ice, for example, is often an ingredient in smoothies. But even if customer inconvenience is the worst priority, do you really want to risk that? On the other hand, ice cream machines can make or break a business. Specifically, any restaurant that deals in desserts will have a catastrophe on their hands if their ice cream machine breaks. However, you’re in luck. Ice and ice cream machines both fall under the umbrella of commercial refrigeration repair, so if you’ve got an issue with either one in your Tampa home or business, call Benjamin Brothers as soon as possible. The most common example of a refrigerated display case would be a cooled grocery store aisle. You know the type — those open-aired produce stands where you pick your broccoli, and the ones with the sliding coolers which host copious amounts of delicious ice cream. Can you imagine what a situation it would be if these were to go defunct? You’re looking at entire aisles worth of food which would be at risk of collecting bacteria, or in the case of ice cream, melting. Grocery stores, fortunately, are big enough to where they usually have a cooler in the back they can move their product to, but this is neither efficient, convenient, or viable in most cases. That’s why the best option is to call Benjamin Brothers for refrigeration repair. We have repaired or replaced a substantial amount of cooled display cases before, and if you take advantage of our 24-hour services, we’ll get the problem taken care of before it becomes a problem. We here at Benjamin Brothers, we believe in helping our community. We’ve served New Port Richie and greater Tampa for over 20 years, and we value the goods and services that local small businesses give to us. We want to help contribute to our wonderful Florida communities, which is why we’re here to help if your equipment goes bad. Got a cooling device that is giving you problems? Contact Benjamin Brothers today for commercial refrigerator repair!